I love to bake. I started helping my mother with the baking as a little girl, and eventually became the primary chocolate chip cookie baker in the household. Your daddy is constantly asking me to bake cookies. He recently attempted a batch on his own, and let's just keep a long story short by saying that you really shouldn't make the full recipe when you've only got a quarter of a bag of chocolate chips, and that I'll stay the primary cookie baker in this household, too. When your daddy got home from work the other day, he was excited to see two sticks of butter sitting out on the counter, a tell-tale sign that baked goodies are in his near future. He asked if I was going to make cookies, and his eyes started sparkling when I confirmed that I was. 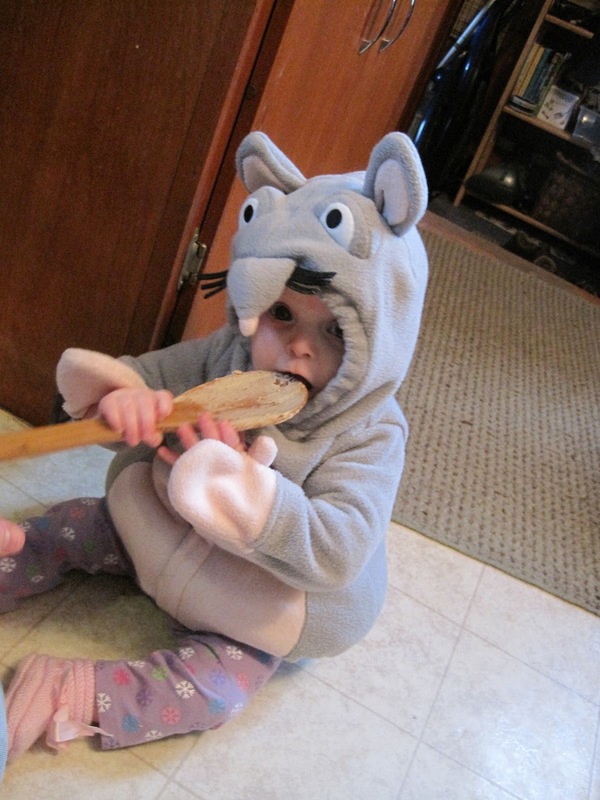 He played with you while I mixed up the dough and got the first batch in the oven, and then brought you into the kitchen to give you your first shot at licking the dough-covered spoon and beater. Perhaps I should explain the mouse thing? Daddy happened upon your Halloween costume while we were cleaning out your closet (which is a story for another day) and you were so delighted to have it on that we let you wear it to play in for a while. Anyway, suffice it to say, you are your mother's daughter, (and grandmother's granddaughter, for that matter) and you love a good spoonful of chocolate chip cookie dough. Upon sharing those photos above, a friend who used to babysit me commented that she remembered my mother keeping a bowl of cookie dough in the refridgerator to snack on at will. Around here, I use it all up to make cookies, but plenty of dough gets taste tested before that final result. While licking the beater is a small part of baking, it's a fun and important one. I enjoy that you're starting to get involved in the process! If you like this blog, and haven't already done so, please vote for 'Dear Delilah, Fine and Fair' on Babble's Top 50 Mom Blogs. Thanks for your support! 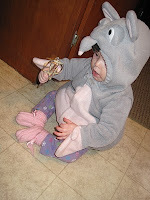 That elephant outfit is just the CUTEST thing ever! ...oh and what's the link to vote for you as the best Mom blog? Adorable pictures! Do you share your recipe? Or do you use the basic tollhouse? I love making chocolate chip cookies!